Great timing! Finding an affordable, pet friendly apartment in Vancouver is proving to be impossible. We may be forced to place our beloved canine companion Brinda in a foster home, and or look in the burbs. Though I conduct a lot of business in the city, it’s been a while since I’ve resided in the city. We’ve gone from 5 acres, to 2.5 acres to a bungalow on a lot and now to an apartment. If we can find one! Vancouver is outrageously expensive, rents high, vacancy rate low, with less than 10% pet friendly. The majority of suites are uninhabitable, dark, depressing, low-ceilinged basements divided into as many cell-like rooms as space allows. “Dorm style,” which translates into a warren of bedrooms with one shared kitchen and bath. I’ve wasted a lot of time and ferry fare driving over for viewings only to be disappointed, frustrated and appalled at the greed. Though Brinda is not an official service dog, she has been instrumental in our autistic son’s development, providing emotional support and a focus, a way to filter out sensory overload. Nobody cares, far as I can tell, the bottom line always profit. Of course, if we had money, it would be no problem. We’d just buy a condo. At least it wouldn’t sit empty like so many condos in Vancouver. Meanwhile people sleep on the streets. 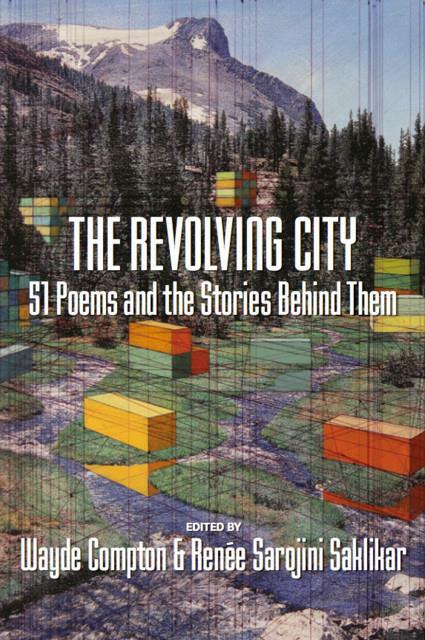 Is it ironic that I am one of 51 poets featured in a new anthology called The Revolving City? Looks like it’s going to revolve right past me. And I can’t help but think of Devo and devolve. I’m more comfortable write poetry than poetics, but here is my contribution. The news. As dismaying as the news may be, it infiltrates. I am no longer surprised that nothing changes, progresses, the word progress quaint. With all the information we digest daily, we know we are not moving forward, that we are merely swept up. To preserve a stance of one’s own is heroic, a valiant albeit futile effort, for the individual cannot withstand an avalanche of humanity. The life force. Our flesh, our pitiful armor, is as ephemeral as our lives. We are equally invincible and weak, eternal and temporal, resilient and susceptible, susceptible to the machinations of machines, technology. Human nature is a constant, though we are as tough and logical as salmon swimming upstream, as evolved as a grizzly bear. We are driven, brilliant, vainglorious and misguided as Frankenstein. I might have titled it Natural Order. That’s all the poem speaks to. Portrays. The flesh came first, flesh responsible for the monster.